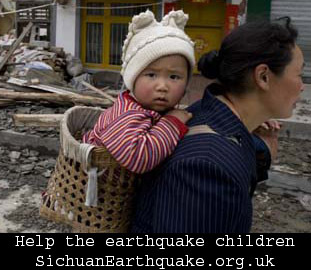 The death toll caused by earthquake is nearly 15,000 and looks set to rise in the disaster area- SiChuan. 10,000 people were thought to remain buried and massive landslides had buried roads to outlying villages. A lot of pupils are buried by the collapsed school buildings too. The local authorities spoke that water, clothes, medicine, and food are mostly needed. Long haul travel is not recommended at this moment due to seriously damaged local traffic. The Chinese Students & Scholars Association (CSSA) at Queen Mary has started calling for help and donations. The CSSA has circulated e-mails regarding the call among Chinese students and many of them have already sent their donations. It is now time to join all our forces and help those who are suffering. Recommendations on the methods of donations are in the following. To help children and orphanages in the disaster area, along with Chinese Embassy, Mother Bridge of Love (MBL) is also making an urgent appeal to all to donate money for the disaster relief, targeting at helping the SUFFERING CHILDREN SPECIFICALLY. MBL thank for friends who called, donated money and shared their concerns. They are calling for more people to join the rescue action. Posted in News | 38 Comments » | Read more..